22 CEMENT AMERICAS • Winter 2018 • www.cementamericas.com FEATURE After the dropping sequence, the diameter of the spread of the mix is measured. The flow of the mix is the percentage increase in diam- eter of spread mix over the base diameter of the molded mix. The key items for this method are the flow table, mold and calipers. ELE also offers an alternative motor- ized unit. The applicable stan- dards are ASTM C230/C230M. 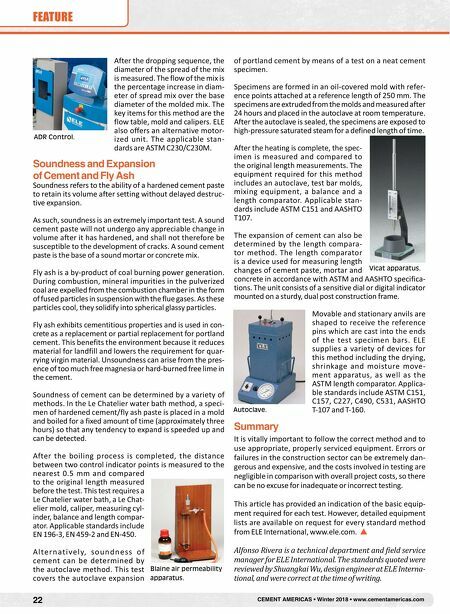 Soundness and Expansion of Cement and Fly Ash Soundness refers to the ability of a hardened cement paste to retain its volume after setting without delayed destruc- tive expansion. As such, soundness is an extremely important test. A sound cement paste will not undergo any appreciable change in volume after it has hardened, and shall not therefore be susceptible to the development of cracks. A sound cement paste is the base of a sound mortar or concrete mix. Fly ash is a by-product of coal burning power generation. During combustion, mineral impurities in the pulverized coal are expelled from the combustion chamber in the form of fused particles in suspension with the flue gases. As these particles cool, they solidify into spherical glassy particles. Fly ash exhibits cementitious properties and is used in con- crete as a replacement or partial replacement for portland cement. This benefits the environment because it reduces material for landfill and lowers the requirement for quar- rying virgin material. Unsoundness can arise from the pres- ence of too much free magnesia or hard-burned free lime in the cement. Soundness of cement can be determined by a variety of methods. In the Le Chatelier water bath method, a speci- men of hardened cement/fly ash paste is placed in a mold and boiled for a fixed amount of time (approximately three hours) so that any tendency to expand is speeded up and can be detected. After the boiling process is completed, the distance between two control indicator points is measured to the nearest 0.5 mm and compared to the original length measured before the test. This test requires a Le Chatelier water bath, a Le Chat- elier mold, caliper, measuring cyl- inder, balance and length compar- ator. Applicable standards include EN 196-3, EN 459-2 and EN-450. A l t e r n a t i v e l y, s o u n d n e s s o f cement can be determined by the autoclave method. This test covers the autoclave expansion of portland cement by means of a test on a neat cement specimen. Specimens are formed in an oil-covered mold with refer- ence points attached at a reference length of 250 mm. The specimens are extruded from the molds and measured after 24 hours and placed in the autoclave at room temperature. After the autoclave is sealed, the specimens are exposed to high-pressure saturated steam for a defined length of time. After the heating is complete, the spec- imen is measured and compared to the original length measurements. The equipment required for this method includes an autoclave, test bar molds, mixing equipment, a balance and a length comparator. Applicable stan- dards include ASTM C151 and AASHTO T107. The expansion of cement can also be determined by the length compara- tor method. The length comparator is a device used for measuring length changes of cement paste, mortar and concrete in accordance with ASTM and AASHTO specifica- tions. The unit consists of a sensitive dial or digital indicator mounted on a sturdy, dual post construction frame. Movable and stationary anvils are shaped to receive the reference pins which are cast into the ends of the test specimen bars. 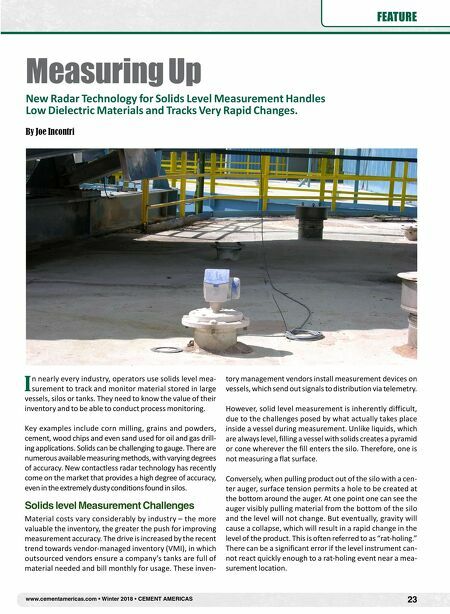 ELE supplies a variety of devices for this method including the drying, shrinkage and moisture move- ment apparatus, as well as the ASTM length comparator. Applica- ble standards include ASTM C151, C157, C227, C490, C531, AASHTO T-107 and T-160. Summary It is vitally important to follow the correct method and to use appropriate, properly serviced equipment. Errors or failures in the construction sector can be extremely dan- gerous and expensive, and the costs involved in testing are negligible in comparison with overall project costs, so there can be no excuse for inadequate or incorrect testing. This article has provided an indication of the basic equip- ment required for each test. However, detailed equipment lists are available on request for every standard method from ELE International, www.ele.com. Alfonso Rivera is a technical department and field service manager for ELE International. The standards quoted were reviewed by Shuangkai Wu, design engineer at ELE Interna- tional, and were correct at the time of writing. ADR Control. Blaine air permeability apparatus. Vicat apparatus. Autoclave.